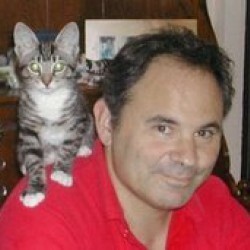 I've been reading fantasy adventure novels for a long, long time. When you read a series of books by the same author, it's hard not to expect the stakes to get raised with each title: new thrills, new surprises, new tie-ins with earlier plots. If you read enough books by the same author, there comes a point where you find yourself beginning to wonder if perhaps, this time, the writer is bluffing -- that s/he has pushed the stakes so high (yet again) that the hand the writer's holding -- the story s/he's written -- can't possibly support the kind of rash bet s/he's just made. As a reader, you sigh, swearing you won't get suckered in yet again, but hey -- you're reading this book because you want the author to win that bet. So you call the bluff. Sometimes the author's just holding the narrative equivalent of a pair of twos--a real let-down. We've all had that experience: the great reveal comes, but we've seen it coming all along -- or it comes out of nowhere and doesn't satisfy. 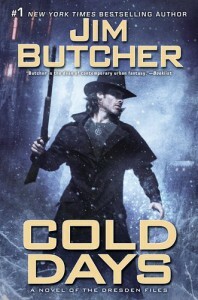 As I began reading Jim Butcher's Cold Days, the fourteenth novel in the Dresden Files series (starring that other wizard named Harry), I was filled with a certain mixture of anticipation and dread: Butcher has pushed his protagonist further and further with each book in the series. His challenges have gotten more difficult, his enemies more vicious, and his gambits more desperate. The complications in his circumstances and in his relationships (with his friends, with his families -- even his semi-non-existent love life) have gotten increasingly complex, thorny, and dysfunctional. The last quarter of the book is taken up with a Battle to Save the World. Again. You can see why I wondered whether -- to change my metaphor -- Butcher was going to be able to pull the proverbial rabbit out of the proverbial hat. He did. For me. Switching back to my initial extended metaphor: I called his bluff and was pleased to find his hand held nothing but paint. Did I see some of what was coming? Sort of; in the first part of the book, he stressed some concepts that had been set up much earlier in the series in such a way that a wary reader was likely to say, "Ah-ha. That's coming back." And some of Harry's relationships (particularly on the romantic front) had hit such an impasse that it was clear that something had to change. Butcher rolls out the final resolution of the grand Ragnarok battle in such a way that all of those expectations that he'd set up in me were fully satisfied--and yet he managed to satisfy them in ways that left me surprised. Some interesting new characters are introduced; some old favorites reappear, but the cast of characters doesn't sprawl too widely to be able to keep the players straight. Harry manages to reach the end of the book in a manner that I found both fulfilling and unforeseen.